A few weeks back, I said Australia really needed to bring it to the esports scene this year if it wanted to be taken seriously on a global stage. Last weekend, I attended exactly the kind of event I was talking about. And it was weirdly surreal. The Fortnite Summer Smash event was held at the Margaret Court Arena to coincide with the Australian Open finals. Having an esport right beside such a high-profile sporting event is proof of where we’re headed. 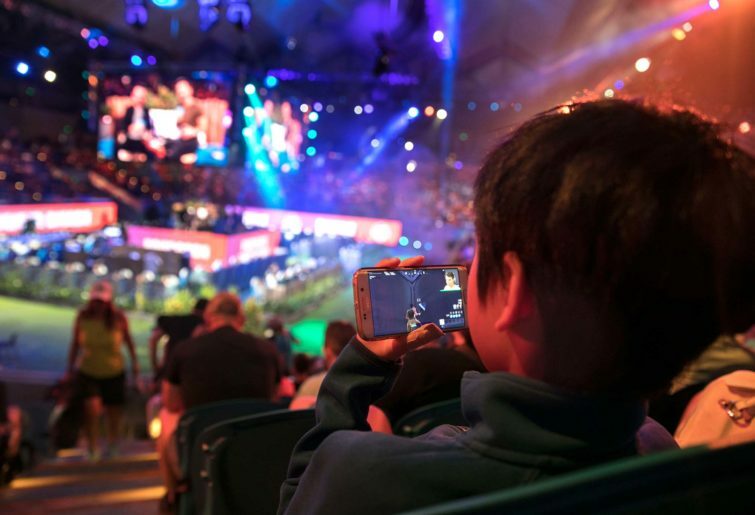 When compared to most other esport tournaments in Australia, it also came with a hefty prize pool – $500,000 in prizes allocated to the Fortnite games. While it’s not unheard of for other countries to have even larger pools, this is new in Australia. Qualifiers were held on Saturday, of which the top 100 finalists made the finals on Sunday. Every one of those players won $1000 just for making it through, then had their shot at doubling it for making it into the top 20 in the next rounds. The winner of it all would take home a cool $100,000. Fortnite is arguably the biggest game in the world right now. It’s free on almost every platform you can dream of and is a massive hit among streamers. Its popularity is so entrenched that kids are regularly spotted replicating dances from the games. It’s not necessarily the biggest esport, but it makes it a perfect melting pot for publicity. Before I even made it into the event, I noticed a long line for a booth where kids could drop in and play some Fortnite. I assumed there was some prize involved to garner such a crowd, but later found out there wasn’t. These kids can play the game at home whenever they like, but they were still lining up to have their shot at bragging rights. Once in the arena, it wasn’t exactly packed but there was a solid showing – far more than I expected. The crowd watched on, ooh-ing and aah-ing at the various plays in unison. Fortnite isn’t the easiest game to follow, with 100 players all doing things at once and crazy building happening, but we all knew when someone on screen died and reacted appropriately. You could feel the atmosphere during tense situations and the release of victory in the crowd. Jesse Eckley from the X2Twins ended up taking out back-to-back games with conservative play. Points can be gained from kills and placements, and coming out number one multiple times – despite not earning points for kills – put him in an early lead. After losing out in the following matches, these early wins ended up earning him a solid following in the arena and the crowd erupted whenever his name came up in the kill feed. He ended up taking out the whole thing and the $100,000 grand prize. 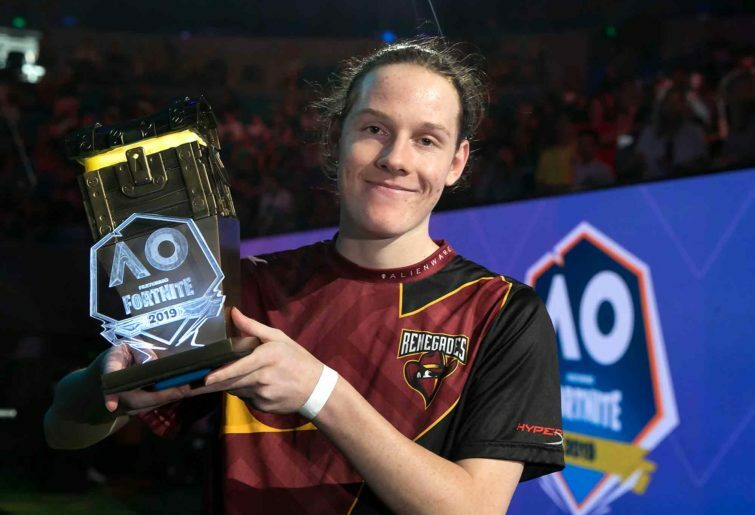 Jesse Eckley wins $100,000 in the Fortnite Summer Smash (Tennis Australia). The downside to this event was it was incredibly stretched out. Six games of Fortnite were to be played by finalists and this was stretched over nearly five hours. The empty space between rounds really killed the momentum and spectators seemed restless. I noticed chairs empty up during the second half of the games and I’m not really sure how many even bothered to see the finals. This was interesting, as it became clear that’s not really the main event at this tournament. Another facet was a celebrity game featuring popular streamers and other personalities. There was a $50,000 charity donation on the line too, so there were still some stakes to this fun game. Some of the players tried to make it to the main competition as well but only one, NSW streamer MrFreshAsian made it through. These weren’t necessarily the best players to turn up, but they were the ones people wanted to see. I was especially hit by this during one of the rounds of the final games, where someone spotted the YouTuber LazerBeam in one of the boxes above the stadium. Kids went nuts and grouped around the stairs, climbing over chairs and chanting “LazerBeam” over and over again. They completely stopped caring about the tournament and were desperate to get one of their favourite streamer’s attention. It was almost like watching the halftime act totally steal the show. I’m not really sure how many people – aside from friends and family of those competing – came to watch the finals. It definitely seemed the celebrity competition was the main draw and, more specifically, the celebrities themselves. It’s going to be difficult for esports to reckon with this – many of the top players do also build their own followings but it seems popularity will win over skill when it comes to crowd’s affections. It’s good to bring these people in for these events to draw crowds but I worry about how esports will ride this line. Traditional sports don’t tend to have celebrities outside of players and analysts – people actually working on the presentation of competitive games. Esports have a plethora of people online whose popularity comes from their ability to entertain while playing – usually they’re also pretty good but it’s not required. This is especially strong with a game like Fortnite and I’m really curious to see how this will play out.